This month we're excited to be working with our friends at Colorado's Elevation Beer Company, who make some of our favorite big beers—built not only with big ABVs but also sublime smoothness and deftly integrated layers of flavor. For the PDF version of the Special Offer Newsletter, Click Here. The order form follows the beer descriptions below. To jump to the order form now, Click Here. For our latest Rare Beer Club special offer, we've been working with Elevation Beer Co. out in Colorado to come up with a showcase of some of their tastiest limited offerings. We had a few beers from Elevation as regular features in the club, and they have proven to be some of the most delicate, carefully presented big beers we've crossed. Elevation brings that precision to this crop of four, starting with their deftly handled barrel-aged imperial stout: Oil Man. 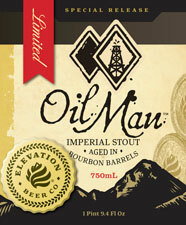 Oil Man pours a super-dense chocolate brown in the glass, quite opaque and capped by rich, frothy brown foam. Not much light coming through, but a generous amount of head from a 10%+ imperial stout. This incorporates a wide malt bill, including chocolate malt along with roasted and flaked barley-and there's no doubt that there is an enormous amount of darker malt complexity here, from the aroma forward. Rich aromatics of cocoa and bitter chocolate, roasted almonds, toffee-all fluidly integrated, with a wealth of chocolate underneath it all. First impressions: this is exceptionally smooth. While there's a ton going on here overall, the central milk chocolate, cocoa and caramelization make for a very streamlined core, and all of the additional complexity plays out from there. Digging in further shows darker, more bitter chocolate profiles, plus roasted coffee, licorice and a subtle hint of anise on the malt side. As this warms up a bit, you can get a touch more of the Northern Brewer and Chinook hops as well-they'll first appear subtly, as a very welcome, mineral- and mint-focused edge of bitter to balance out those malts. As long-time RBC members can attest, we pretty obviously drink a fair number of imperial stouts in the club. Our favorites are the silky-smooth ones like this. 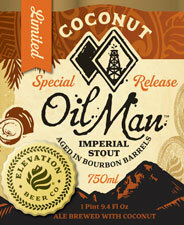 Where the standard Oil Man offers up an immense degree of core chocolate tinged with rich caramelization... Coconut Oil Man goes a whole other step forward. The coconut aromatics appear bold and well toasted above the chocolate foundation, taking the standard Oil Man to a deeper dessert territory. This conjures a chocolate coconut macaroon, balancing the potent coconut oil smoothness alongside more prickly aspects of dark specialty malts. It's incredibly rich, layered, and the aroma feels both silky smooth and certainly deep enough to get lost in. The zesty, fine-bubbled carbonation underpinning this stout gives it a vibrancy despite how much is going on. That precise execution when it comes to mouthfeel is one of the aspects we enjoy most about these Elevation special releases: well-layered beers that are structured to actually be enjoyable and explorable. There are savory roasted malts, dark chocolate, and a wealth of licorice and warming alcohol at the first sip, with the hop additions providing the same welcome edges seen in Oil Man. The coconut's toasted, rich, oily, and never in the way. We've had a number of top-heavy coconut beers over the years, but this firm imperial stout serving as the main Oil Man profile here is the perfect base for a memorable coconut beer. We're loving the higher-ABV beers Elevation has been producing, and this combination of a rich, honeyed quad with the tannins and vanilla-minded contributions from the time spent in oak barrels is just exceptional. This barrel-aged beer especially stood out for epic drinkability. Elevation's Red Wine Barrel Aged Apis IV pours a dense maple-syrup/cola brown with a bit of burgundy tint coming through. The tiny-bubbled foam is well formed and a lighter tan in color, leaving solid lacing on the edges of the glass. From the moment that this is poured, its exceptional aroma lays out very clearly what this beer is about-combining a precise amount of caramel and honey alongside just the right proportion of barrel. There's a massive, velvety midsection to this, with complex esters and spice, plus hints of vinous warmth and amaretto. Even when poured quite chilled, this beer opens up beautifully right from the beginning. There's a plush core texture throughout this, a combination of smooth caramel and cola and red fruits and toasty vanilla/almond notes from the wood that comes together seamlessly. There's not any sort of distracting tartness, as one could associate with aging in red wine barrels, and the oak-barrel presence lands much more like soft oak and vanilla than a strong show of the Cab Sauv that previously occupied this barrel. It's a perfect counterpoint to that generous quad. With some time to warm up to proper temperature in the glass, though, this red-wine-barrel-aged quadrupel shows its full depth. The honeyed elements expand into further herbaceous, almost-minty dimensions with other contributing notes, while the depths of the quad's malt bill become apparent, offering up brown sugar, dried fruits, toast and toffee. There's a rich, tannic element from the Cabernet Sauvignon barrels that slowly emerges, with more of that red-wine character, and overall this beer just continues to add in levels as it warms up. 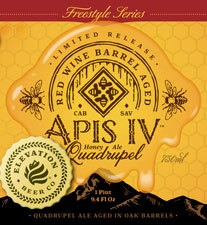 This is one of the most unique quads we've ever tasted-an epic limited release from Elevation. 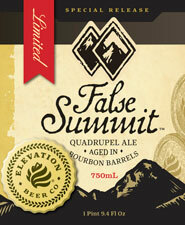 To round out this collection of massive Elevation releases, we've got the delicious bourbon-barrel-aged quadrupel ale that is False Summit. This comes in at over 11%, and it brings in some entirely different dimensions from what we've seen from these beers so far. This quad is brewed with additions of Belgian pale malt and dark candi sugar, and-much like the Oil Man brings forward a vast imperial stout spectrum-False Summit is an exceptionally deep and honeyed take on quad land. Ripe fruits, herbaceous honey, a touch of mint in the nose. False Summit affords tons of honeyed malt complexity, with fine-bubbled carbonation and some warming alcohol providing some endearing textural components beneath. Where the Oil Man and variants head into chocolate and cocoa turf, the honey and caramel and chewy dried fruit here provide for one of the most expressive quads we've had in a very long time. Notes of toffee and dates lead into warming, vinous alcohol and a plush layer of red berries and burnt caramel. A very different profile from the big stouts-but equally vast and tasty. Click here to read or download the full special offer newsletter. As always, if you have any questions or want something different from what we have listed above, please contact our Customer Service Team at 800-625-8238 and we will do what it takes to make it work.